Going into this year, it was doubtful that Taylor would know that it would be his last as England Manager. He had been fortunate that their Group rivals and main rival for a spot Holland had also been struggling and had dropped points along the way. The year started with a qualifier at Wembley on February 17th against the weakest Nation in Europe, San Marino. The English were expected to score at will and hope to pad up their goal differential. Taylor gave a debut to Queens Park Rangers striker Les Ferdinand to achieve such a task. In the absence of Stuart Pearce, David Platt was named Captain. He would go on to have a memorable night by scoring four times in England’s (6-0) win. He also missed a penalty kick and missed a chance to score five goals in a match. Carlton Palmer and Les Ferdinand in his debut rounded out the scoring. England’s next qualifier was away vs. Turkey at Izmir on March 31st. England came away winners (2-0) through goals by Platt and Gascoigne to still maintain some hope. By now Norway seemed odds on favorites to be one of the qualifiers and the second qualification spot seemed to be between England and Holland. The English faced the Dutch at Wembley on April 28th. It was a must win match for the English to have any hopes of qualifying. They came out on fire and scored twice early on. John Barnes scored from a free kick in the very first minute and David Platt doubled the lead in the 23rd minute. At this point it seemed England were home and dry. However, an injury to Paul Gascoigne appeared to change England’s mood. Dutch Captain Jan Wouters elbowed the English star who had to substituted off at halftime because of a fractured cheekbone. In the meantime, the Dutch pulled a goal back through Dennis Bergkamp in the 34th minute. England still seemed able to pull a win when with five minutes remaining Des Walker fouled Marc Overmars in the box. Peter van Vossen scored from the ensuing penalty kick to earn them an important away point. The incident somewhat also summed up Des Walker’s season. His transfer to Italy’s Sampdoria that season had not been a success and his form suffered. He was never the same player and many felt the Walker of yesteryears would have caught with Overmars and certainly not fouled him. Taylor was very hurt after this match and told the media that he had felt like crying after a win eluded them in the closing stages. But worse was yet to come to another busy end of season/summer for the National Team. England’s next qualifier was on May 29th at Chorzow vs. Poland. Taylor gave Tottenham Hotspur striker Teddy Sheringham his first cap. England were behind for much of the match after falling behind in the 34th minute to a Dariusz Adamczuk goal. They only tied the match in the 84th minute thanks to substitute Ian Wright’s equalizer. A few days later World Cup qualification was clearly compromised after England were comprehensively defeated by Group leaders Norway (0-2) at Oslo on June 2nd. It was not just the loss but the manner of it. England were a lost team without direction. ‘The Sun’ Newspaper’s headline read ‘Norse Manure’. Taylor acknowledged tactical errors by deploying a (3-4-3 formation) and did not offer excuses. Right after this match England had to fly to the United States to participate in the US Cup, which was a dress rehearsal for the following year’s World Cup. The US organizers had made sure that quality was not lacking in advertising the game to the home public so they invited Brazil, Germany along with England. If the already demoralized English thought things could not get worse they were wrong. On June 9th at Boston, Massachusetts, they suffered a humiliating loss to their American hosts (0-2) with goals by Thomas Dooley in the 43rd minute and a header by Alexi Lalas in the 72nd minute. For this match, Taylor had appointed Paul Ince as Captain and in doing so he became the first black player to captain England. Taylor tried to see the positive in a dark day and thought this might turn out to be the reference point where England’s fortunes would change. He also tried to minimize the results by claiming that the purpose of the tour was to gain experience. The Press and tabloids predictably would have none of it. The major headlines were as follows: Daily Mirror ‘Resign!Resign!, The Sun ‘yanks 2-planks 0’, Daily Mail ‘Rime’s Up, Taylor’ and Daily Star ‘End of the World’. All that was left was to pick up the pieces and at least end the tour on somewhat of a positive mode. On June 13th at Washington, DC they faced Brazil. Taylor gave Tim Flowers a debut in the net. England’s performance was generally better and they led through Platt in the 47th minute before Brazil leveled the score through Marcio Santos in the 77th minute. On June 19th they concluded the Tour vs. Germany at Pontiac’s Silverdome (Indoor) Stadium in Michigan. Stefan Effenberg gave the Germans the lead in the 26th minute but Platt equalized soon thereafter. Jurgen Klinsmann scored Germany’s winner in the 53rd minute. Despite the loss, England’s performance had been better superior to that of the USA match. This was also England’s seventh consecutive match without a win, their worst run since 1958. 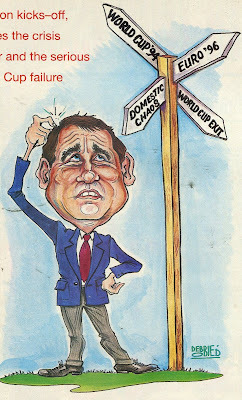 In all the summer of 1993 had been disastrous to England and demoralizing. A point lost at Poland was followed by a loss at Norway followed by an even more humiliating loss against USA. The improved performances vs. Brazil and Germany could not mask England’s problems. And of course all the blame was laid on Taylor and his continuous unimaginative style of play and tactics. Taylor’s response was that he had to take the criticism on the chin and all he could do was to “get my head down and work”. 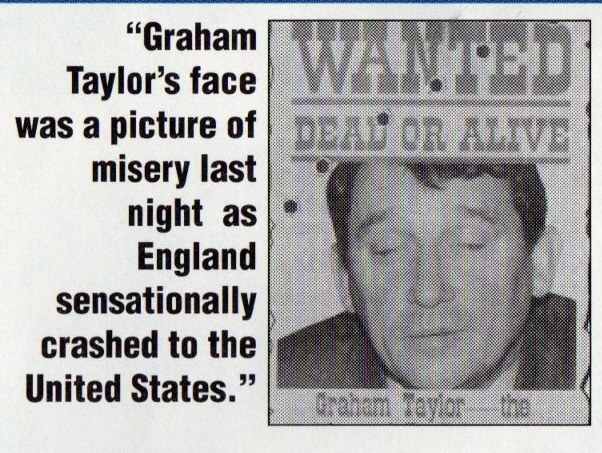 Taylor was so unpopular at this point that a Political Party called ‘Sack Graham Taylor Party’ was formed (Its candidate Peter Newman received 80 votes). England’s first qualifier of the new season was at Wembley on September 8th vs. Poland. David Seaman was elevated as the Number One for this season and would remain into the next decade. England defeated Poland (3-0) without much difficulty through goals by Les Ferdinand, Paul Gascoigne and Stuart Pearce (now in the Second Division with Nottingham Forest). 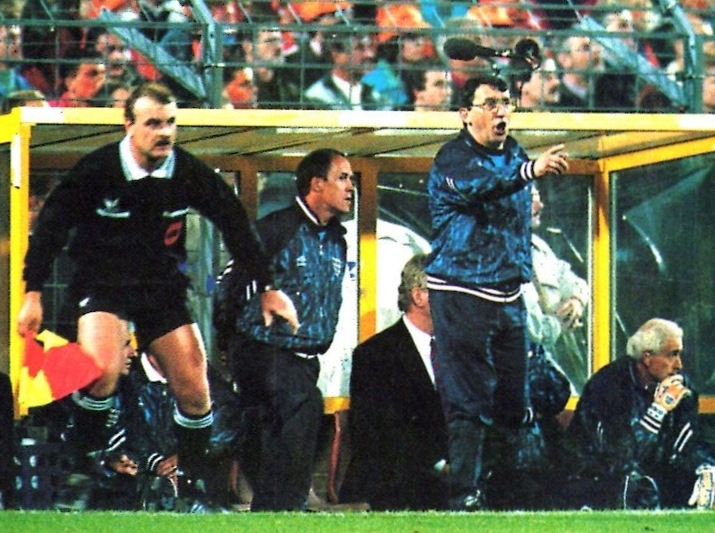 The stage was set for the key qualifier vs. the Dutch at Rotterdam on October 13th, 1993. Everything for both teams was riding on this match. This match would go down as a classic and one of the most talked about matches in Football history. It had drama, controversy, bad referring calls as well as expletives (from Taylor). And of course it ultimately was responsible for ending Taylor’s reign as England Manager. The day before the match, Taylor held a press conference with English and Dutch journalists. The tone quickly changed after English Journalist Rob Shepherd from the ‘Today’ Newspaper (now defunct) made a reference to the match in Oslo by stating “I think you are going to play the same way we did as Oslo”. This bad memory really riled Taylor up and responded, “This is one of the biggest things that has ever shaken me”. He asked the Journalist in question to stay upbeat and think positive like his squad. He continued by saying that if any one of his players had been as down and negative he would immediately drop them from the squad. He insisted that all was good and the players were excited to take part in this match and qualify. When Rob Shepherd persisted in his line of questioning, Taylor responded that they were going to be victorious and urge the others to stop their negativity. He told them to “raise yourselves”. This drew smiles from all journalists even the Dutch contingent. 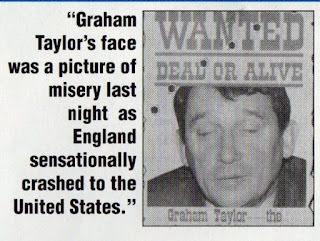 The Press conference had ended in a lighter note, but the newspaper headlines the next day characterized the exchange as a ‘Temper Tantrum’ by Taylor. The talking point of the match would be concerning the German Referee Karl-Joseph Assenmacher’s decision regarding an incident involving the Dutch Captain Ronald Koeman. This occured with an hour of the game played. David Platt with clear sight of the goal was brought down by Ronald Koeman right outside of the box. The England players protested for a penalty, however, replays clearly showed that the foul had occurred just outside of the box. Nevertheless, according to the rules, Koeman should have been sent off; instead he got off lightly by only receiving a yellow card. Later the Referee admitted he would have given penalty kick had not been overruled by his linesman. Just moments later, the Dutch were awarded a free kick. Koeman who should have been sent off earlier took the responsibility to take this decisive free kick. It was a twice taken free kick; the first time there was encroachment in the English wall. The second time Koeman delicately chipped it over the outstretched arm of David Seaman. Minutes later in the 67th minute, Dennis Bergkamp killed off England’s hopes with a second goal. England were eliminated and failed to qualify for the World Cup for the first time since 1978. At the Final whistle, a visibly angry Taylor approached a FIFA representative and told him that Koeman should have been sent off earlier and now he was sure to get the sack. Moments later he told the Assistant Referee that “I was just saying to your colleague, the Referee’s got me the sack, Thank him ever so much for that, won’t you”. Of course all these exchanges were recorded as a result of him wearing a microphone because of “The Impossible Job” documentary. A single qualifier remained on the schedule, a trip to Bologna, Italy to face San Marino. Going into this match, for the English to have any chance (miniscule as it was) of still qualifying, the Dutch needed to lose in their last match and England had to defeat San Marino by more than seven goals. It was a tall order and the Dutch did defeat the Poles (3-1) to qualify. England defeated San Marino (7-1) in Taylor’s last and ultimately inconsequential match (Amazingly, San Marino scored after 8 seconds). Taylor made Bklackburn Rovers’ Stuart Ripley his final debutant. 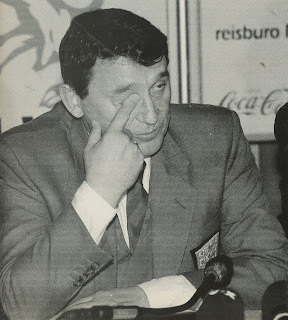 Less than a week after this match on November 23rd, 1993, Graham Taylor resigned as Manager of England. He had gone through more than three years of constant Media and Tabloid criticism and character assassination that was the hallmark of the position. He stated that had he known what he would have gone through, he would have not taken the job. He believed he had gone from being a respected Manager at Aston Villa to an England Manager “without an ounce of credibility”. 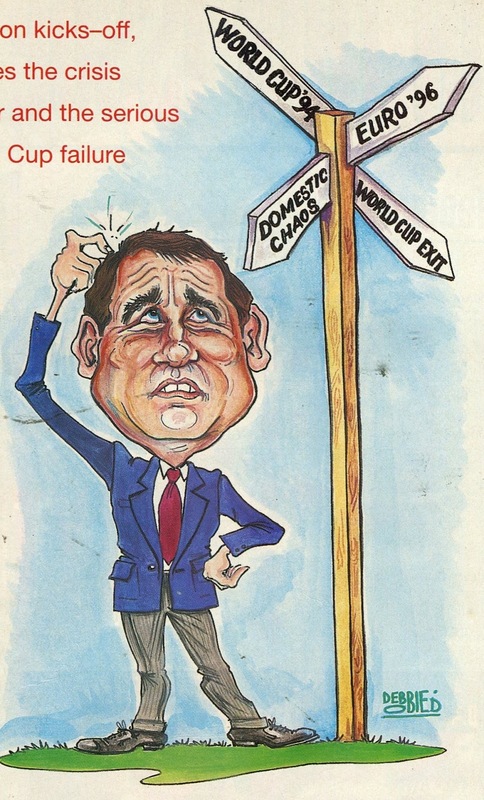 For many Taylor’s fault was in not building up on the success of the 1990 World Cup. Instead he became a link to the past by reverting back to a typical British outdated system of tactics. His devotion to Charlie Hughes’ ‘Long Ball’ tactics was NOT the way forward. 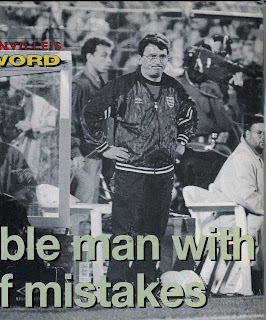 Many feel that was the reason why he turned his back on talented players such as Peter Beardsley and Chris Waddle. The absence of Waddle at a time when he was at his absolute best was puzzling to most. 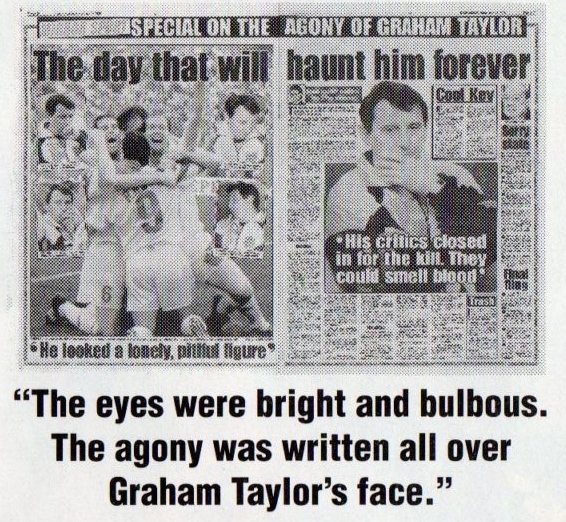 For his part, Taylor felt he was taking over a team in 1990 at the end of their cycle and not necessarily a team on the verge of a breakthrough. Many critics felt his success at club level was in his ability in improving lower level and standing teams, but he could not emulate the same feat at the Top of the English game. Critics also felt that he selected too many players and changed players and tactics from match to match and did not create the stability needed. The constant player changes was a sign of indecision. The media believed his selections reflected his preference for hard working players who did not possess much flair nor creativity. Players were recalled after years away for a match or two and then disappeared without a trace. In only three years, Taylor selected 65 players for National Team duty (59 of those played). He handed out debuts to 29 players. Of his new caps, nine of them (Tim Flowers, Nigel Winterburn, Gordon Cowans, Andy Gray, Steve McMahon, Stuart Ripley, Matrk Hately, Mark Walters and David White) played just once. His involvement in “The Impossible Job” documentary further showed him in a negative light. In the programme Taylor dropped the ‘F&%@’ profanity a total of 38 times and railed against players and officials. His use of the statement in the documentary: "do I not like that" became a source of mockery. He was unlucky that Paul Gascoigne and John Barnes were injured for the majority of his time in charge. One can only speculate of Taylor’s fortunes had they been fit. Of course, the problems with Gascoigne went beyond his fitness. The circus surrounding him with Tabloids did not help him nor Taylor. 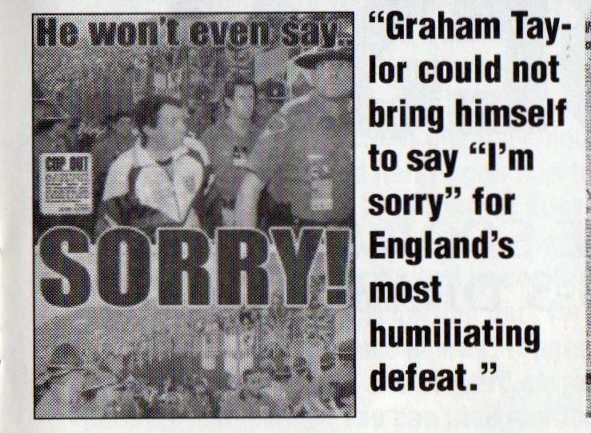 His relationship with Gary Lineker also came into question, especially after the substitution vs. Sweden in Euro 1992. A few months later, Gary Lineker disclosed in his autobiography about their strained relations and his anger in being substituted in the match vs. Sweden as well as not starting vs. France on February 1992. Taylor responded that Lineker had put his personal commercial interests ahead of the team and always maintained that the Sweden substitution was for Tactical reasons and nothing personal. 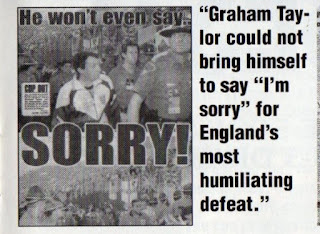 Many years later, Lineker felt the whole situation was blown out of proportion. By then he believed that there was no malice from Taylor and believed he had taken his decisions on tactical and not personal grounds. 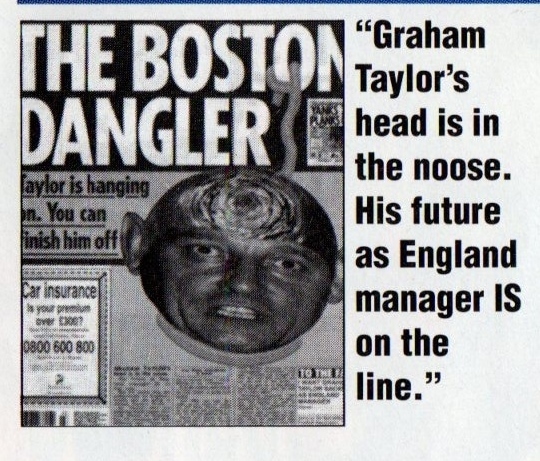 Brian Glanville, one of his fiercest critics as England Manager, often pointed that Taylor was a good decent man, but was ill suited to manage England. Many others have since came out and described him as a good decent man on personal level and all around Gentleman. In time he went back into management and managed Wolverhampton Wanderers and his former clubs Watford and Aston Villa. 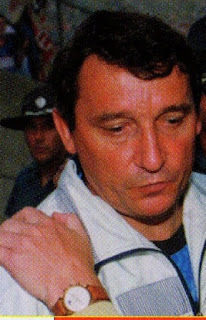 He promoted Watford to the Premier League in 1999 before retiring for the first time 2001. He returned to Aston Villa in February 2002, but left and retired at the end of the 2002/03 season. He later had stints as Vice President of Scunthorpe United, Football Pundit (on BBC Radio) and alaso served on the Board of Watford. Graham Taylor passed away on January 12th, 2017 from a Heart attack. He left behind his wife Rita (married in 1965) and two daughters.